The debate continues: Should you also replace the water pump when changing the timing belt or not? For Continental, it’s a no-brainer: Always replace the water pump at the same time as changing the timing belt! Why? Changing a timing belt is a very time-consuming repair. It would therefore be irresponsible towards the customer not to change the wear parts at the same time and risk more fitting work – and therefore additional costs – if the water pump fails. With its kits, Continental makes it easy for workshops to change everything in one go. Because they contain all the necessary components for changing the timing belt – including the water pump. 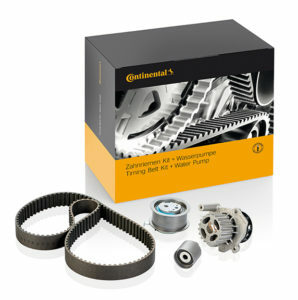 Continental is therefore expanding its range of timing belt kits + water pump in 2019. “We’ll be adding some 50 new kits to the range.” reveals product manager Adrian Rothschild. There are, for instance, new kits for Honda, Lada and Chevrolet. “We’re not just developing our products for common repair applications, but are also quite specifically covering niches. Ultimately, we want to offer workshops the appropriate solution for all marques and vehicles,” says Rothschild. For these new products, too, of course, Continental grants registered workshops a 5-year guarantee. The range is being continually expanded. All the current applications and references can be found online in the Product Information Center (PIC).